Studies of ice melt in the Arctic suggest that the world may have a fighting chance of preventing huge sea level changes that would result from the dramatic collapse of the vast ice sheets that cover Greenland, but that more work is needed to understand the wider effects. And as rising temperatures in the Arctic have led to the sea ice that covers much of the region's ocean to retreat even further, scientists have been nervously studying Greenland's melting ice sheet to see how it is being affected. They fear that without the insulating effect of the sea ice – along with its ability to reflect the summer sunlight ­– Greenland may suffer accelerated levels of melting in the coming decades. Indeed, with global temperatures currently at their warmest in more than 11,000 years, there are concerns that the world may have already committed itself to the melting in Greenland over the coming decades. Now, research that uses sophisticated computer models to simulate the relationship between the Arctic and the ice sheet in Greenland is suggesting that this may not be the case. Researchers working on the Ice2Ice project have shown that changes in the sea ice and on Greenland's ice sheet appear to occur largely independently of each other. Sea ice is prone to temperature changes in the layers of water in the ocean beneath it while most of Greenland responds to atmospheric temperature rises. The finding indicates that while the Arctic sea ice appears to be diminishing, Greenland's ice sheet could remain for centuries to come. It suggests that efforts to cut greenhouse gas emissions and limit global temperature increases to below 2°C above pre-industrial levels, as set out in the Paris Agreement on climate change, may allow the world to prevent the sort of melting that would lead to catastrophic sea level rises. 'It means we do not need to worry about any secondary effects from the loss of sea ice on ... (surface) melting in Greenland that is occurring due to the greenhouse effect,' explained Professor Jens Hesselbjerg Christensen, a researcher of climate physics at the Niels Bohr Institute in Copenhagen, Denmark and one of the lead coordinators of the Ice2Ice project. The Ice2Ice project reconstructed how Arctic sea ice and Greenland's ice sheets have responded to climate changes in the past by analysing ice cores from Greenland and sediment cores from the bottom of the Arctic Ocean. They used this information to build a simulation of what may happen if the world continues to warm. ‘We ran an experiment where we had 15°C of global warming, which is very high, to cause all of the sea ice to disappear,’ said Prof. Hesselbjerg Christensen. ‘Even so, the response in Greenland only seemed to be driven by the overall enhanced greenhouse effect. It stays steady for hundreds of years and we were not able to see much of an impact from the loss of the sea ice.’ He said the ice sheet started to change its shape after several hundred years. While simulating such extreme warming might seem to be unrealistic, some parts of the Arctic are already experiencing abrupt changes in temperature at a local level that could mimic this in the coming decades. While global temperatures are estimated to have increased by around 1°C compared to those in pre-industrial times, this is an average increase around the world. Some areas will experience greater warming – like the Arctic – while others will not. This has led many to consider the Arctic to be a kind of canary in the coalmine for what may lie in store as the world continues to warm up. The Stockholm Resilience Centre in Sweden recently identified 19 regime shifts that it considers to be markers of how climate change is transforming the Arctic. It found that there is already evidence of 15 of these regime shifts taking place in the Arctic as the warming climate causes irreversible changes in the vegetation on land and ecosystems in the ocean. One recent paper published last year in Nature found evidence that the loss of Arctic sea ice might impact precipitation patterns around the world, driving an increase in droughts and fires in places like California, which this year has seen devastating blazes tear through its towns and countryside. Most of our knowledge about the changes currently taking place in the Arctic come from satellite imaging that show reductions in summer sea ice over the past 40 years. Unfortunately, to really understand whether these are due to humanity's influence on the climate or natural variations in the environment needs data that goes back further into the past. The IceDynamO project is attempting to build up a high-resolution reconstruction of the sea ice cover in the Arctic Ocean off the coast of the northeast Greenland ice sheet. 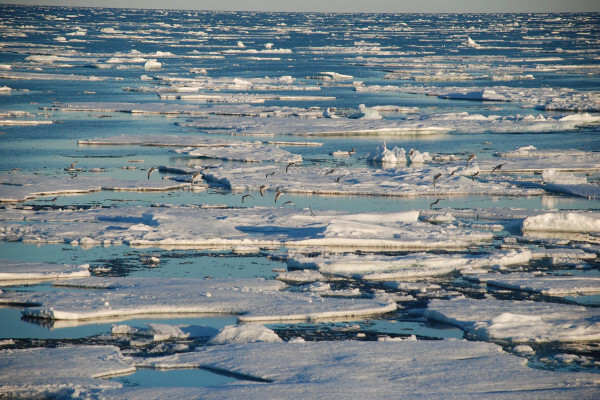 Using information stored in the sediment at the bottom of the ocean, researchers on the project are piecing together how the sea ice varied over the last few millennia and how the ocean and atmospheric conditions may have influenced that. Although the project only started earlier this year, the results should help to inform scientists' attempts to construct models for how the Arctic is likely to change in the coming years. The fate of the region could have profound implications not just for those living there but elsewhere in the world too. Where is Earth's Freshwater Going?